Food Origins is a Salinas-based SAAS startup that captures specific data points from fruit and vegetable harvesters in real time. The data provides valuable actionable insights for worker productivity and efficiency, allows precise produce traceability, and enables productivity-based employee pay. Food Origins was part of the 2016 THRIVE Accelerator cohort and is a member of the Western Growers Center for Innovation and Technology. We spoke with Food Origins Co-Founder and CEO Nathan Dorn to get his startup story and to learn more about his technology. I understand you grew up on a farm, and that you were a nuclear specialist in the Navy. At what point in your career did you pivot back to ag? In my last year of enlistment, when I started a family, I decided it was time to move to private industry. I took a job at Pepsico Bottling near Detroit where I learned a ton about continuous process improvement and lean process management like Deming and Drucker. I was recruited to Gallo Wines and ended up in the vineyards as Director of Research and Development for Gallo Sonoma Vineyards. After the stint with Gallo, I was recruited to Reiter Affiliated Companies (Driscoll’s Berries’ largest grower) as the Director of Knowledge and Innovation. My role there was to examine the business challenges, to stop us from doing things that were painful to the business, to go, buy, and implement a solutions, and finally to invent solutions if all other paths were exhausted. This made my work impact every department, and solutions did not work until every system change was addressed. I soon learned that we were not innovating fast enough to meet our opportunities, so we started to share our challenges with the startup community, asking them to help us. With Driscoll’s engagement, we started an ‘Open Innovation Network’ to share our problems with startups. One of our early success stories was Agrobot, whom we convinced to come to California from Spain in 2013. I like to think that our efforts helped to stimulate robotics firms in the sector. Today there are more than 11 companies that have taken up the challenge of automated harvesting of strawberries, whereas in 2013 there were none in the United States. Did this experience pique your interest in starting your own firm? Yes, I got the ‘entrepreneurship bug’ to innovate specifically in areas where no one was innovating. In 2015, a friend from my days at the Naval Postgraduate School, who had read some articles I had written on our innovation challenges in berries, connected me to Dr. Richard Sowers at the University of Illinois. Richard, Food Origins’ co-founder, was instrumental in determining the specific operational areas we could capture and quantify data so that we could make real-time science-based decisions to help improve specialty crop production. Richard, who is a math professor, visualized the variation showing up between areas of land, field workers, and cultural practices. We knew that in the midwest, geospatial data collection on yield drove a doubling of yield over the last 30 years, as well as a doubling of revenue for growers by facilitating an environment of continuous improvement. Having the data also led to growers adopting other new technologies and being more targeted with inputs like fertilizers. Our thinking was – why not apply this opportunity to specialty crops in the Salinas Valley? And there is a big need. Today, there are small strawberry producers who still use punch-cards and spreadsheets to run their multi-million dollar operations, whereas a corn operator in the midwest moved into precision technology that integrates process data more than a decade ago. I understand that Food Origins is launching its services commercially this year – what is your specific value proposition? Food Origins uses IoT hardware to capture and convey data that hand-harvesters collect in the field. We use this data to highlight yield and quality variation and opportunities for improvement in labor efficiency and cultural strategies. A side benefit is that we can provide product traceability as well as payroll data collection. Our service allows users to capture insights and strategies in ways that are scalable based on very few data points. The way we do this is by integrating our data points with data that’s being captured by other means. In fact, there are almost fifty additional value propositions for the data we have with our current efforts. It’s up to the user to take advantage of all the potential insights we provide. Here’s an example. We did a trial where we used our data to intersect with aerial imagery that the grower had taken of the same variety planted on two different dates. The imagery showed the earlier-planted rows looking vigorous, with the later-planted rows struggling. What our harvest data showed was that the struggling plants set more fruit than the more vigorous plants, which was surprisingly counter-intuitive. Based on this trial, the grower decided to plant this variety later to induce stress and improve profitability. Tell us about your team and the financial maturity level of the company. Our software team is based in Salinas. Most are CSU Monterey Bay and Hartnell Junior College grads, who were able to complete their BS in Computer Science in 3 years, thanks to the philanthropy of the Matsui Foundation. We are pre-revenue and working hard on our business model to ensure that we create value and are able to recover some that value for ourselves. Right now, we infuse funds from my ag consulting business into the firm. The good thing is that a lot of my consulting customers are interested in becoming Food Origins customers and respect our conservative views. How has being a local from Salinas impacted your business? One thing that differentiates Food-Origins is our office is a mile south of the city of Salinas. When I open my window in the morning, I see strawberry fields. To engage in trials and meet customers, all I have to do is literally step out the door. To be a local has been a distinct advantage, but the burden of being a local is that you feel every challenge of your friends and customers. How does Food Origins fit in as specialty crops move to automated harvest and the distribution system moves to blockchain? Our service quantifies opportunities for robotics and other cultural practice changes. We bring a massive amount of data to integrate into the blockchain system, making it exponentially more valuable. For example, we can tell you the heat units a box of berries received on a certain date, which is a very important data affecting the consumer as the climate continues to change. I am an ag guy, so I feel I understand how growers can be uncomfortable with risky investment. I want to create a systemic change for the industry, and it is not an easy sell. It’s also not as glamorous as a drone or a robot. In California, there is a tension between providing a ‘living wage’ and unsustainable labor costs in agriculture. Can your technology play a role here? I grew up on a pig farm in Nebraska scooping lots for $3/hour. I was good and the farmer told me, so I understand very well the importance of performance and creating value. It’s no different today in our company. 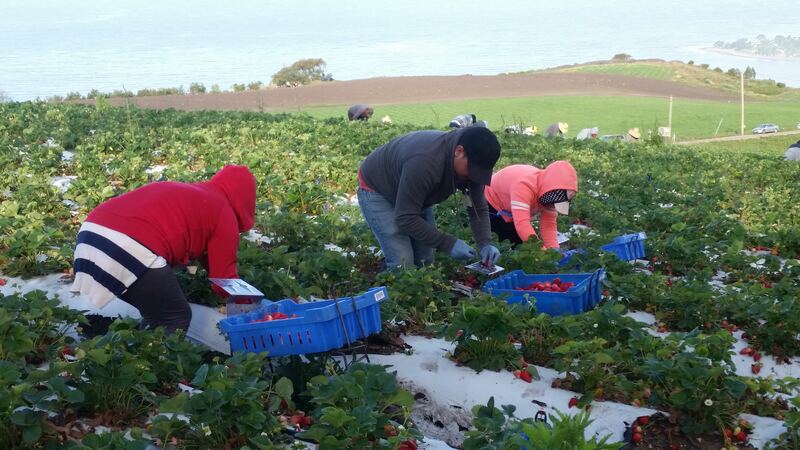 The first day on the job, every new employee picks strawberries and has productivity monitored and quality-judged. We share how much money they would have made, profit to the farmer, quantity per acre and quality of a product. Then, they monitor professional field workers and do time-motion studies. They quickly realize they make better software engineers than harvesters, who out pick them 10:1. The whole purpose of this is to help them recognize that harvesters are professionals, just like they are, only at a different job. Our technology collects data that allows productivity, merit-based pay. I like to use the analogy of a baseball team, where each player gets paid differently but is part of a team engaging in a single activity. Like baseball players, each harvest professional should be paid based on the value they create to the business. If we are ever to move in that direction, we need to start capturing information the right way today. Food Origins provides employee portals where harvesters can see their individualized opportunities for work and unique pay. We share data back to them as well allowing them to measure the things that matter to them. We still feel engaging more problem solvers to address our challenges is the best way to improve the farming system. Food Origins illustrates how being intimate with the challenges of an industry can yield novel new solutions. We look forward to seeing how Food Origins grows with the rapidly-changing fresh berry industry.